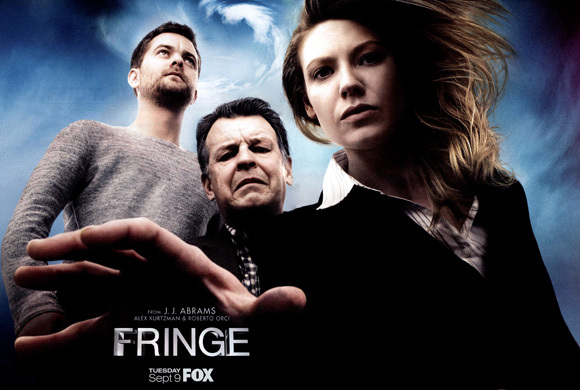 Gossamer Obsessions: Fringe 1x03: "The Ghost Network"
This episode opens in a confessional, as a terrified man named Roy (a.k.a. that dude from Revolution) is worried that the painful visions he's been having might be the product of the devil. However, he can't muster up the courage to reveal everything to his priest and he flees - dropping a page from his sketchbook in the process. The page reveals a sketch of terrified people choking and screaming on a bus. Later that day, our Fringe Buddies are called to the scene of particularly awful Scientific Fuckery. A bus was discovered filled with a hard, crystallized substance - the passengers inside frozen as if trapped in amber. Walter deduces that it's the result of a weapon that's released as a gas and then solidifies when it reaches the air, suffocating and immobilizing its victims. After recovering a video camera from the wreckage, Olivia realizes a woman's backpack was taken from the bus before the attack. It appears this woman - Anna Jiminez, an undercover DEA agent - was the intended target. Her handler says she'd asked to be pulled out when the members of the drug cartel she'd infiltrated started talking about The Pattern. However, Roy's (confessional-vow-breaking) priest gives his bus-sketch to the authorities, who quickly round him up. Olivia and even Broyles are confused - this schlubby office drone doesn't fit anyone's profile of a mass murderer. Neither of them believe he did it - and yet his apartment is full of sketches and adorable dioramas of Mad Science Shenanigans (including the events of the previous two episodes) all of which were variously drawn, sketched, collaged and glue-gunned before the events actually took place. Walter recognizes Roy's visions from the theoretical research he did in the '80s with his former colleague William Bell (the founder of Massive Dynamic!). By injecting a special serum into the brain, people could be able to telepathically transmit information over a mental frequency - a "ghost" network - without anyone overhearing. And it turns out Roy was one of the Walter's test subjects back when he was a college sophomore. Peter is appalled, and this is pretty much the first sign we get that cuddly Dr. Crazypants wasn't always the nicest or most ethical of scientists. Anyhoo, Walter figures out that the people organizing the Pattern have been using the Ghost Network, and Roy's visions have been the result of him unintentionally "eavesdropping" on their plans. Walter decides to reprogram Roy's brain to interpret the Ghost Network information as words instead of images in order to track the people who attacked the bus. Olivia, using information from Roy, goes after the people responsible (including Anna's handler! ), and recovers a strange, translucent disk he'd taken from Anna. It's anyone's guess as to what it does, but it's likely important - important enough for Broyles to give it to Nina Sharp of Massive Dynamic without telling Olivia. And Roy is free to go home - now that the Pattern Peeps know the Ghost Network's been compromised, it's unlikely they'll use it again, meaning no more visions. Best Death Scene: While the idea of suffocating on solidifying gas is gruesome, the best death goes to Matthew Ziegler, the Pattern henchman who backs into an oncoming bus rather than surrender to FBI officials. BOOM! Who was that man Peter accosted, who said Peter needed to "check in"? What was that strange disk Olivia recovered for the Fringe Buddies? And what does Nina Sharp hope to do with it? How are the folks at Massive Dynamic still receiving information from dead John's brain?